She was supposed to be working on her spelling words, but out of the corner of my eye I could see her turning around, watching as I carefully lined up our flashcards across the kitchen floor. I knew I had her interest piqued. Sitting still is something my daughter doesn’t do. That’s one reason I am constantly looking for fun ways to learn math facts that let her move. This simple hands-on math activity for kinesthetic learners was so much fun, I couldn’t wait to share it with you. This activity can be set up for use by an individual or you can set it up “race style” for multiple students. To set it up for an individual, grab the flashcards for the math facts you wish to focus on and create a path for your child to follow. Make it fun! Have the flashcards go down the hallway, under the kitchen table, or even up the stairs. Have your child follow the path. In order to step onto the next card, they must answer it correctly. 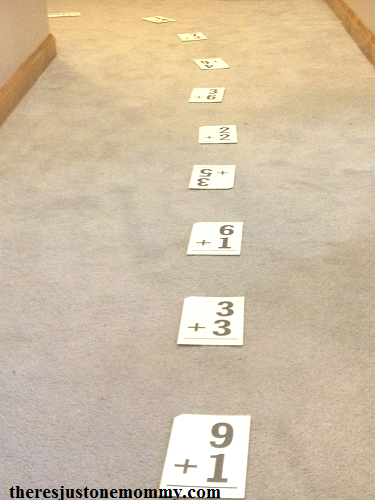 To set up the math activity for two or more students, line up your flash cards side by side. Make sure each row of flashcards has the same number of cards. Have students start at the first card. In order to move on to the next flashcard, they must answer the math fact correctly. If they make a mistake, have them take one step back. Who can get to the finish line first? Now we have another way to make math fact practice fun. Your child may even like to hop like a bunny! You can find even more fun hands-on learning activities your child will love in our ebook ABC’s & 123’s. You can do this activity with addition, subtraction, multiplication, or division problems. To make it even mre challenging, mix it up and use different types of problems! 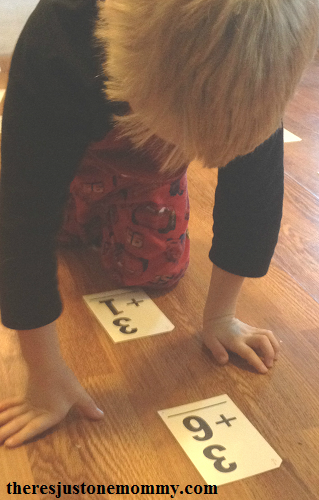 Flashcards with oversized numbers make seeing the problems easier during this activity. To keep your flashcards looking nice you may want to laminate them first. If you are having a race you may want to have a small prize, although it isn’t necessary. The race itself was enough motivation for my two. We have been having lots of fun with this kinesthetic math activity this week. It’s so simple to set up and much more fun than your typical flashcard drills. These math games also make math practice more fun. Subscribe to our mailing list and get your free printable addition and subtraction math bingo cards today! I LOVE this idea! Kids sit waaaaay too much nowadays and math can seem “boring” if it’s always seat work for fact practice. 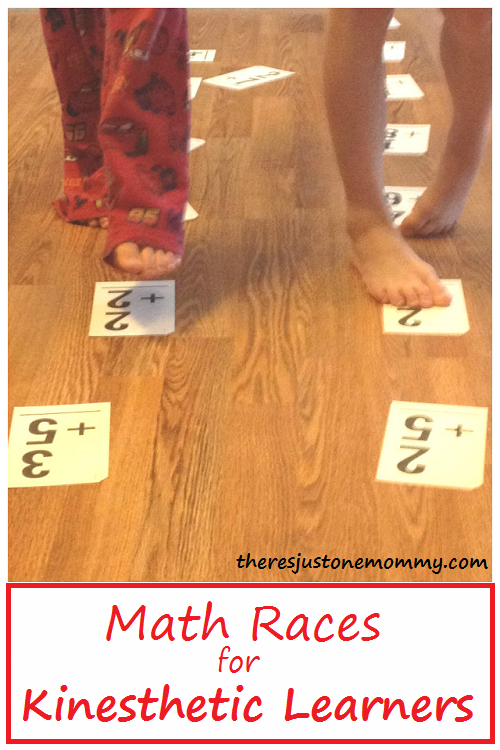 Fact fluency makes math so much easier – what a creative way to teach it! Young kids aren’t meant to sit all day at a desk. My daughter’s need to move inspires us to do all kinds of learning that is up and about. I’m hoping to share more ideas soon. What a great idea! My kids would love this. Anything to get them up and moving. We do something similar. I sit at the top of our stairs and hold the cards. When they get the answer right, they get to move up a stair. If they get it wrong they move down a stair. They win when they get to the top of the stairs. We love doing this for sight words. Love that! We have done that with sight words, too, but not math facts yet. I am putting it on our list to do this week! You’re too kind! Thank you. And I hope you have as much fun with it as we did. Great idea! My girls definitely like to move and have trouble siting still. Thanks for linking up! 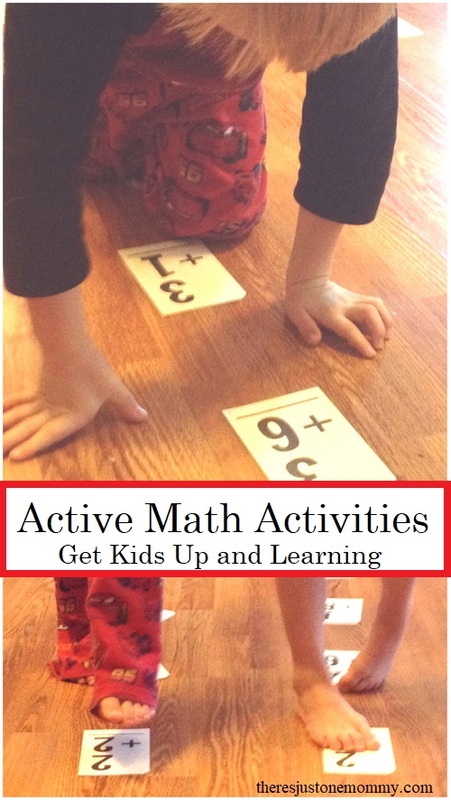 Such a great way to reinforce those math facts while keeping kids moving! Thanks for sharing!